We, at ICER K9, utilize modern breeding techniques and medical studies in our breeding program. We emphasize temperament, health, socialization and physical traits. We truly believe there is always a dog suited for everyone, and we work with our partners and friends to make that match possible. Our breeding stock is comprised of the finest European working lines, mainly from former East German (DDR), West German and Czech dogs. Because these are working lines, and as the name implies “these dogs need to be active”, we will always ask you what is the intended purpose for the animal. WE WANT YOU TO SUCCEED with the new addition to your family nucleus. 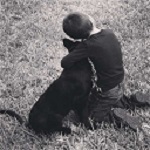 German Shepherds love children if given proper socialization training from an early age. They love to play with children if they are trained well to do so when they are young. Proper puppy training is essential along with love, care, and respect towards your pet. ICER K9, MAKING YOUR DREAMS COME TRUE!